I’m in the middle of a hectic stretch that has me running around. On Saturday, I was invited to visit Giffen Memorial Elementary in downtown Albany for their 2nd Annual “Author/Illustrator Day.” It turned out to be a beautifully organized and attended event, sponsored by the good, kind folks at the First Presbyterian Church who have sort of adopted Giffen as their community school, as they try to positively impact its children and parents on many fronts. It was an honor for me to be a part of it, along with Rose Kent, Myles & Sandra Pinkney (those Pinkneys pop up everywhere, like mushrooms after a rain storm), and Joseph Bruchac. Probably not wise to play favorites, but Joe Bruchac — wow, wow, wow. He is a master storyteller and such a dignified gentleman and artist. Big respect. I signed a lot of books, many of them purchased for the students by the folks at the First Presbyterian Church. 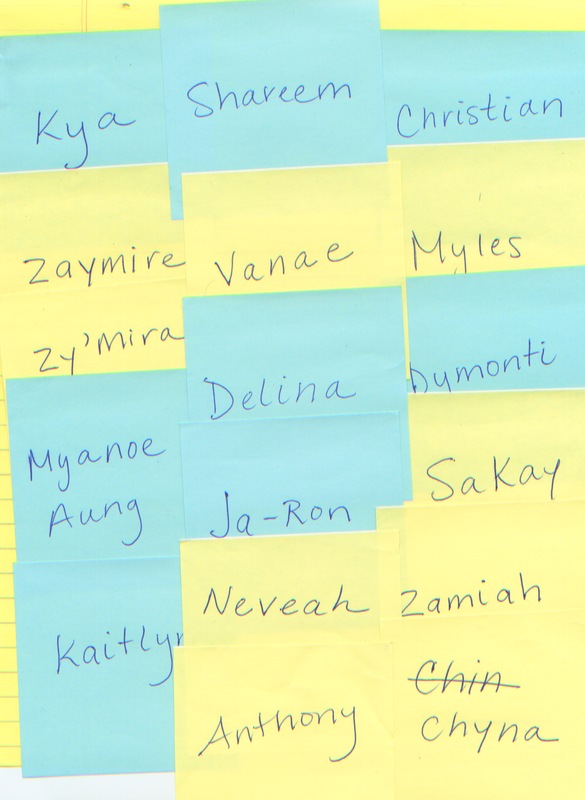 In this case, the children came with their names written on Post-It Notes. By the end of the day, I had a stack of them and shoved it into my book bag. Look at these beautiful names! On Sunday night, I drove to Tenefly, NJ, in preparation for a busy Monday. I spoke with students in grade 6-8 at Demarest Middle School early in the day — great kids, terrific staff, beautiful area of NJ — then drove west on 80 to Parsippany Public Library for a truly lovely memorial event, the fifth so far, hosted by the family of Elaine Galliker, a former 2nd grade teacher who, by all reports, loved bringing books and readers together. It was touching to be a part of something so heartfelt and community-focused. I gave a presentation to a group of adults and a few dozen young readers, and later, once again, signed a bunch of books. Special thanks to Roberta Abel for managing all the emails and small tasks that make these visits possible. 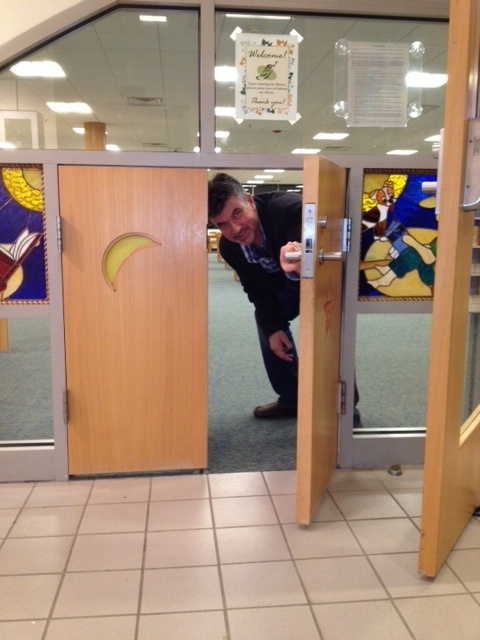 One cool thing about this library — they have a little door leading to the children’s section. Sure, there’s an ordinary big door for us taller, wide-bodied types. But there’s also a magical door for the wee folk. From what I saw and heard, the kids love it. Tomorrow morning, I am taking a 6:00 AM flight to San Antonio, Texas for the TLA Conference. I have a late dinner date with a gaggle of teachers and librarians — as well as a few fellow authors and publishing types. Should be fun, not to mention filling. On Thursday, I’m participating in an afternoon panel discussion: “The Graveyard Shift: Programming Around Mysterious and Scary Books.” When that’s done, I’ll be racing off to the airport again. Should be home by midnight, Thursday, tired and grateful and inspired to write.